On Monday, TechCrunch founder Michael Arrington wrote that he would press the CEOs, VCs, and other Silicon Valley leaders who he was interviewing at TechCrunch Disrupt about the NSA scandal. “I’ve brought this up in every one of my preparation meetings with the people I’ll be interviewing. There has been some pushback. Some people don’t want to talk because lawyers. Others say this isn’t their fight and they can’t effectively lead their organizations from behind bars. Over the course of the three day conference, Arrington interviewed 13 of the most influential people in the tech industry on stage, including Facebook CEO Mark Zuckerberg and Yahoo CEO Marissa Mayer. Dropbox founder Drew Houston and Paypal co-founder Max Levchin also discussed the NSA with other TechCrunch writers. Let’s take a look at the highlights from their talks. Full videos of each speaker’s comments regarding the NSA, and some analysis, are below. Conway argued for a balance between national security and personal freedoms, and claimed he’s too busy advocating for gun control and immigration reform to devote time to the NSA issue. Arrington pressed Conway the hardest, repeatedly questioning why Conway hadn’t taken action on the NSA issue. Conway was candid, noting that immigration reform is a bigger issue for him personally, but didn’t delve into a ton of detail on his personal beliefs about the NSA and the right balance he would like to see. Lee and Pokorny, who are partners at SV Angel with Conway, mostly stayed out of the NSA discussion while Arrington and Conway locked horns. Zuckerberg and Mayer hold the most interesting positions for this debate, as both Yahoo and Facebook were implicated as participants in the PRISM program. Both companies have strongly denied involvement with the NSA and have pressed the government to allow them to reveal more information about the requests the NSA makes for information and how they handle them. Zuckerberg was surprisingly candid on the topic, saying, ““I think the government blew it.” It would have been nice to hear more from him about Facebook’s involvement in the PRISM program. Zuckerberg was happy to slam the government on its handling of the scandal, but didn’t talk in much detail about Facebook and how it interacts with the NSA and what steps he is taking regarding the PRISM program. “With the appropriate safeguards, I’m comfortable with people knowing the two and from of my phone calls,” Doerr, a partner at Kleiner Perkins, said. Doerr advocated for “independent and rigorous judicial oversight” of the programs, and he and Arrington seemed to just agree to disagree on the NSA. TechCrunch writer Josh Constine asked Houston how the NSA leaks have affected Dropbox’s business. Houston said that “day to day, it doesn’t have much of an effect” on Dropbox’s operations, and added that he’s frustrated as a citizen by the government’s lack of transparency. In the conference’s opening interview, Arrington asked San Francisco Mayor Ed Lee what Lee was doing to protect himself and the city from NSA snooping. Lee offered an interesting split between his thoughts as an individual and his role as Mayor, citing his experience in installing cameras around San Francisco to prevent crime and catch criminals while preserving some level of privacy. Biswas, the co-founder of Meraki, said that as far as he knew, the NSA’s intelligence-gathering programs had nothing to do with products Meraki made. He didn’t comment on the larger implications of the NSA scandal. Neither one seemed particularly riled up by the issue. Levchin talked to TechCrunch co-editor Alexa Tsotsis, and was the strongest supporter of the NSA. He discussed applying to work at the NSA while in college, and seemed to have a high personal respect for NSA employees. While Levchin had an interesting perspective, I think he overlooked some of the negative behavior of the employees, like spying on their love interests, and failed to address the issue at its highest level. Just because Levchin respects the employees who are working to defend the United States doesn’t mean that the program and agency at a high level don’t need serious scrutiny and changes. Arrington seemed to be joking a bit, but also expressed some frustration, noting, “I’m not getting anyone to care so far on stage,” as he spoke with the two Greylock partners. Hoffman said LinkedIn, at which he is Executive Chairman of the Board of Directors, has no direct server access for the NSA. 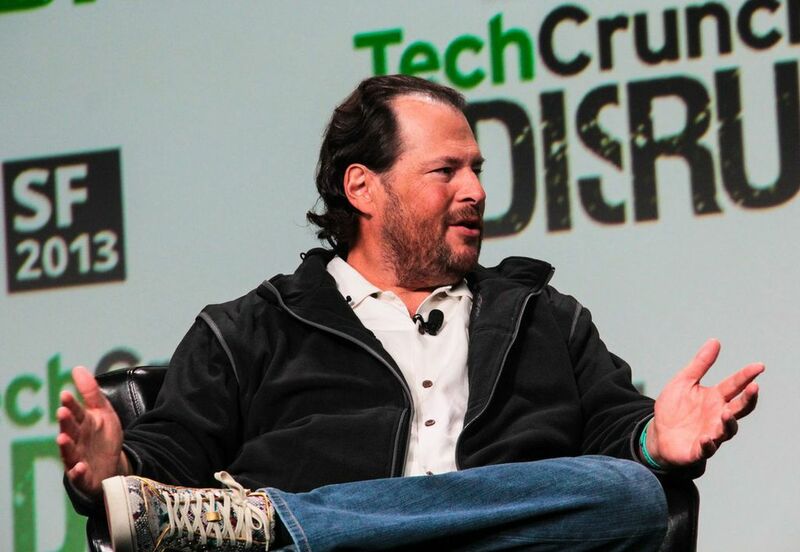 Salesforce.com CEO Marc Benioff was the only interviewee who Arrington didn’t grill on the NSA. Early in their interview, Arrington remarked, “And we’re gonna get to the NSA stuff later,” before launching into a question about Apple. That question led Benioff to share some amazing stories about Steve Jobs, and the two got so caught up discussing Jobs that they ran over time and skipped the NSA topic. Mayer repeatedly spoke about treason, and said she and Yahoo have no choice but to comply with the NSA. When pressed, she noted that treason usually results in jail time, although many bloggers and pundits openly question whether the government would prosecute and incarcerate CEOs like Mayer and Zuckerberg for speaking out about the NSA program. I agree with Max Levchin – says @marissamayer on NSA, surveillance etc. Not sure I (& @arrington) agree with @mlevchin at all. He made interesting points about different kinds of freedom, and how Americans giving up online privacy may be allowing us to avoid things like frequent security checkpoints in the real world.